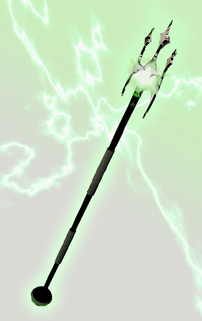 The Lightning Rod is a trident-style weapon used by Superheroine Squad member Jade Lightning to assist her in fighting crime. Like its name infers, the rod’s conductive metal material allows her to channel and amplify her already potent electrical powers, enabling her to direct and “fire” her electric abilities with increased accuracy, distance, and force. Beyond that, the rod doubles as a durable and efficient melee weapon, which Jade Lightning is quite skilled at wielding.